Hard-working public employees are forced to pay money to a government union as a pre-condition of employment. The decision to financially support a union is a decision that employees should get to make for themselves, not one that is decided for them. Especially when their dues—and “fair share fees”—are being used to advance politics that may conflict with their beliefs. As my colleague Kim Crockett wrote about here, public sector unions almost exclusively support one political party and its affiliates. 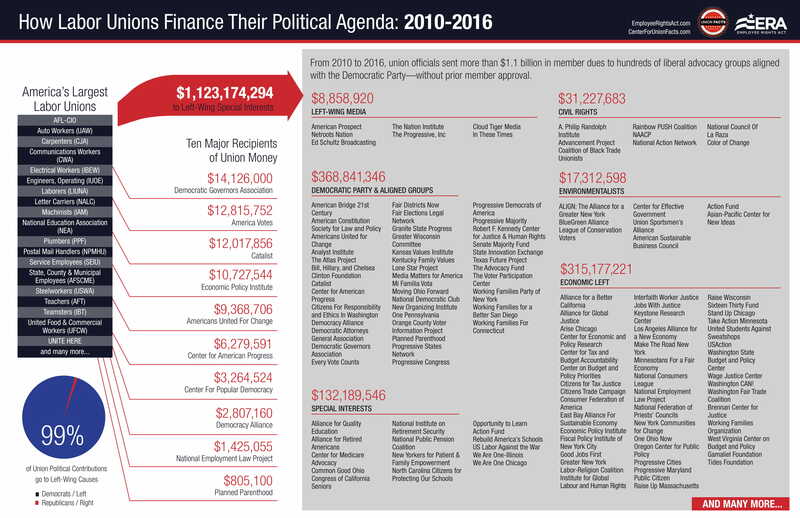 A helpful analysis by Center for Union Facts determined over $1 billion in dues over a six-year period went to support left-wing politics and Democratic candidates. Like a previous post I wrote, this post will raise awareness about another group being financed by union money without prior member approval. Center for Union Facts determined just over $805,000 of union money has gone to support Planned Parenthood from 2010 to 2016. Planned Parenthood Federation of America is a “nonprofit organization that provides sexual health care in the United States and globally,” according to its website, and is the largest single provider of abortion procedures in the U.S. The organization recently released its 2016-2017 annual report, self-reporting it received $543.7 million in government funding (“Government Health Services Reimbursements & Grants”)—which accounted for 37 percent of Planned Parenthood’s revenue—and performed more than 320,000 abortions nationwide. Planned Parenthood’s Action Fund (its PAC) directly contributed $671,000 to federal candidates in the 2016 cycle (this does not include money spent to support candidates indirectly through mailings, phone banking, etc.). Ninety-eight percent went to Democrats and one percent to Republicans ($10,000), based on data released by the Federal Election Commission and reported by the Center for Responsive Politics. For the 2018 cycle, over $102,000 has gone solely to federal Democratic candidates. The long-term contribution trends of public sector unions have consistently favored one side of the political spectrum. Government unions claim to support “giving workers a voice” yet silence the voices that push back against the status quo. All of our civil servants deserve to have their voices heard.